The Trade Literature Collection at the National Museum of American History Library includes catalogs of almost any product, but did you know there is even a catalog with games and puzzles to play at a dinner party? 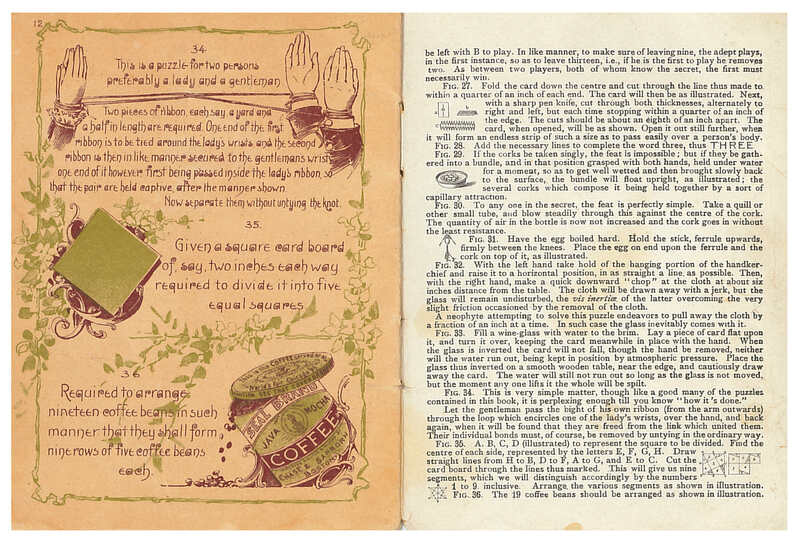 The trade catalog is titled After Dinner Tricks & Puzzles With Your Seal Brand Coffee and it is from 1896. At the bottom of the front cover, it reads, “Compliments of Chase & Sanborn.” Chase & Sanborn was a company in Boston which sold coffee. The front cover of the catalog shows a group of ladies and men sitting around a dinner table. Some of them are drinking coffee. It looks as if they are just about to try some of the tricks and puzzles from this catalog. Chase & Sanborn, Boston, MA. 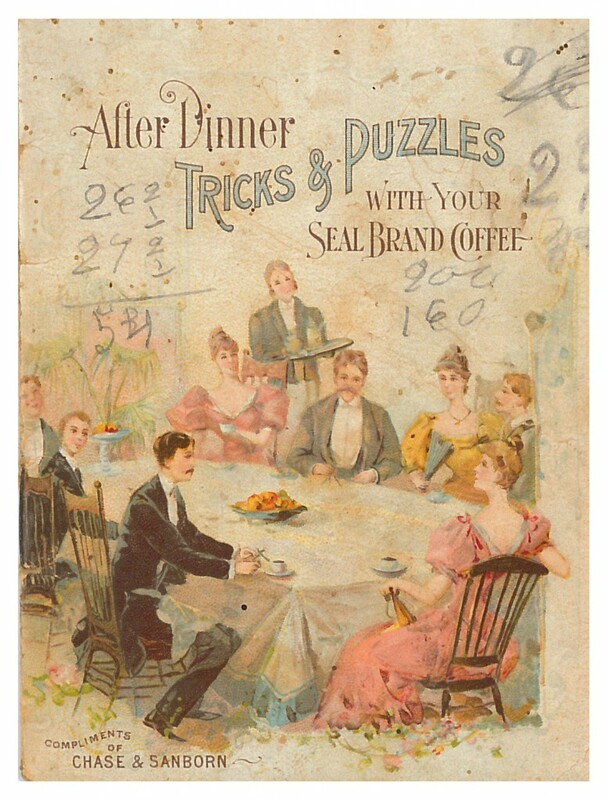 After Dinner Tricks & Puzzles With Your Seal Brand Coffee, 1896, front cover, ladies and men sitting around a dinner table. Chase & Sanborn, Boston, MA. After Dinner Tricks & Puzzles With Your Seal Brand Coffee, 1896, pages 6 and 7, tricks and puzzles numbered 16 through 21. The answers can be found on the inside front cover, shown below on the left page. Chase & Sanborn, Boston, MA. 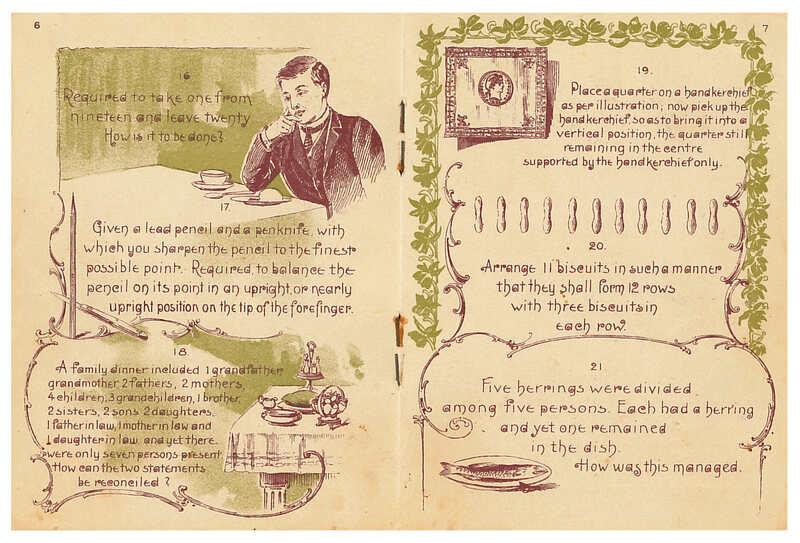 After Dinner Tricks & Puzzles With Your Seal Brand Coffee, 1896, inside front cover and page 1, left page (inside front cover) gives answers to tricks and puzzles numbered one through 26 and right page (page 1) shows tricks and puzzles numbered one through three. Click to enlarge. But, wait! Don’t look at the right page below until you are ready. The answer to number 36 can be found below on the right page. Chase & Sanborn, Boston, MA. 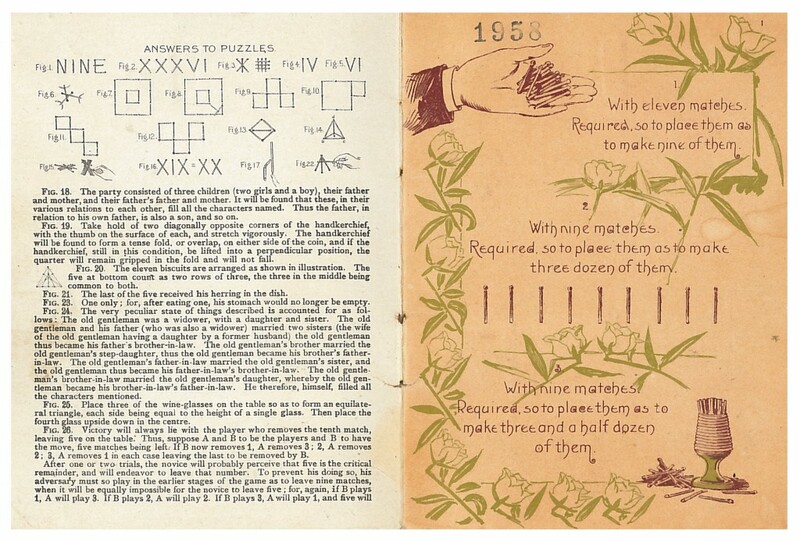 After Dinner Tricks & Puzzles With Your Seal Brand Coffee, 1896, page 12 and inside back cover, left page (page 12) shows tricks and puzzles numbered 34 through 36 and right page (inside back cover) gives answers to numbers 26 through 36. Click to enlarge. The catalog ends with an advertisement for the coffee. 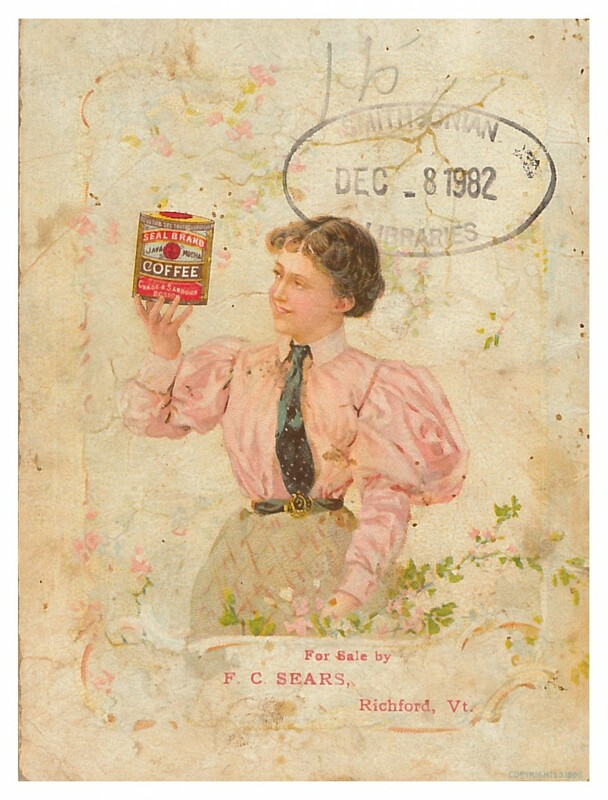 The back cover shows a lady holding a can of Chase & Sanborn’s Seal Brand Coffee. Chase & Sanborn, Boston, MA. After Dinner Tricks & Puzzles With Your Seal Brand Coffee, 1896, back cover, lady holding a can of Seal Brand Coffee. After Dinner Tricks & Puzzles With Your Seal Brand Coffee is located in the Trade Literature Collection at the National Museum of American History Library.